How will Brexit impact the China-U.K. relationship? Turmoil triggered by Brexit may have masked a more troubling market move -- China's currency is falling again. Since British voters' shock decision to leave the European Union, the yuan has lost 1.3% against the dollar. That's small compared with the 12% plunge in the British pound since the EU referendum, but it contributed to the yuan's biggest quarterly loss on record against the dollar -- down nearly 3% in the three months to June 30. The yuan was trading around 6.67 to the dollar on Tuesday, its lowest level since December 2010. China still tries to manage its currency, and significant moves in the past year have roiled global markets. Investors are watching warily. 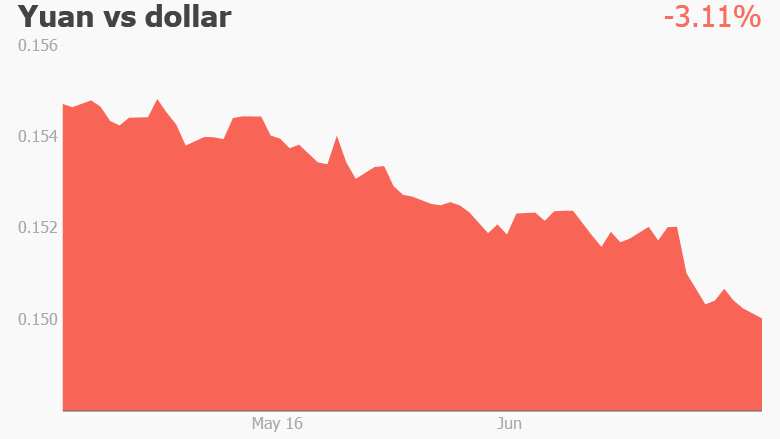 Many economists say they expect the yuan to continue to weaken against the dollar -- but gradually. The dollar surged against most major currencies after the U.K. vote on June 23 as investors poured cash into safer assets such U.S. Treasuries. That gave "China some cover" to depreciate the yuan faster that it would have done otherwise, said Brian Jackson, a senior China economist at the research firm IHS. "They can say, 'It's not our fault the dollar is so strong -- the dollar is a safe haven,'" he said. Kit Juckes, a strategist at Societe Generale, described the yuan's recent moves as a "stealth depreciation." But China has more to worry about than the dollar. Last year, Beijing said it would start measuring the yuan's value against a basket of major currencies, including the pound and the euro. 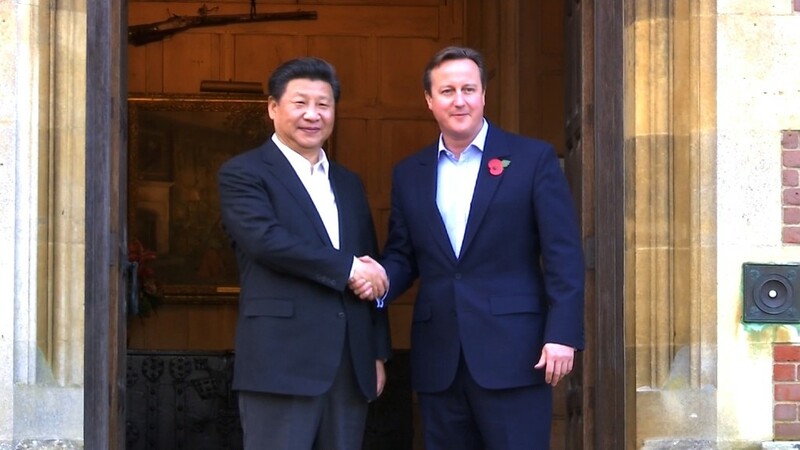 Both of them were hammered after the Brexit vote, forcing an appreciation in the yuan. That creates a headache for Chinese policymakers. The EU is China's biggest trading partner, and a stronger yuan makes China's exports less competitive. They were already struggling. But the big fear is a sudden drop in the value of the yuan. That happened in both August and January, sparking market panic. Investors later regained their composure, but the yuan's latest slide to its lowest level in more than five years has drawn fresh attention. "If it continues, this could trigger another bout of global jitters about currency devaluation," wrote Mark Williams of Capital Economics in a research note last week. He said the Chinese central bank's management of the exchange rate was the "greatest concern" in the near term for China. A sharp devaluation in the yuan could send shock waves through markets that are still reeling from the blow of the Brexit vote. It could also set off a political firestorm in the U.S., where Republican presidential candidate Donald Trump is already accusing Beijing of manipulating its currency to gain a competitive advantage for its exports. And the big sums of money flowing out of China's slowing economy could intensify again as investors seek better returns elsewhere. Last year, analysts estimated as much as $1 trillion poured out of the country. Beijing has a huge stash of foreign currency reserves that it has dipped into to fend off pressure on the yuan, which is also known as the renminbi. It burned through hundreds of billions of dollars last year to prop the currency up. The war chest is still well stocked at more than $3 trillion, but if capital outflows accelerate again, that could renew concerns that surfaced in January about the stockpile being eroded too quickly. Still, China's central bank may have learned its lesson from the January turmoil. Since then, officials have said a big devaluation isn't in the cards. Williams of Capital Economics said he assumed China would change tack if worries about the yuan's dollar rate reemerged. In a statement late Monday, the bank said it aimed to keep the yuan's exchange rate "basically stable at a reasonable and balanced level." -- Yuli Yang contributed to this report.